Love, love, love. Beautiful and amazing quality. I have been searching everywhere for a good rug that wouldn’t cost a fortune. If your in the fence, don’t hesitate. You will absolutely love this rug. 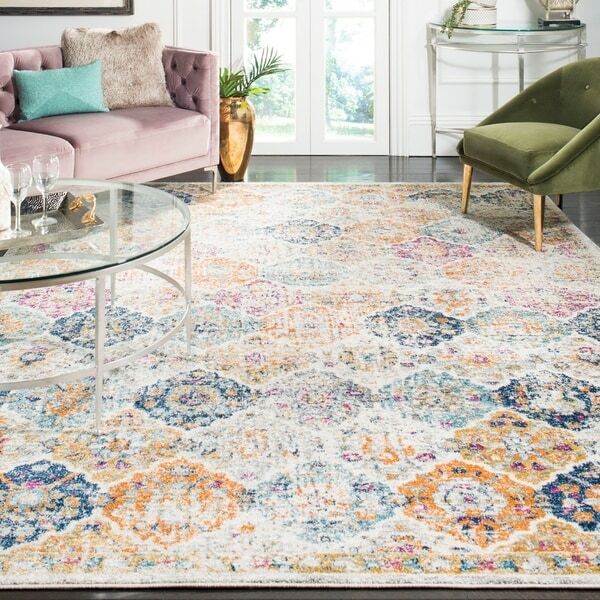 I love this rug... the colors are fantastic ... the quality is unbelievable ... Iwould recommend it to anybody that wants to add a pop of color to an area it definitely exceeded my expectations! Great price! The rug lays flat easily. We didn't use a pad. I love the way this rug is colorful without over-powering the room. I have ugly wood floors, and I don't want full carpet and can't afford hard wood so this fit the bill nicely. It is in my dining room which we recently painted two tone green, and we hung "cream" drapes that were too dressy, shiney, and gold with the lights on so this rug dressed them down nicely even though there is no green in the rug.. When I went to pick out a console table,I realized I could have gotten red or other colors, not just black or wood stained even though these exact colors are not in the rug. I am matchy/matchy when decorating, but with this rug as my starting piece I can use any style of furniture and decor except "contemporary farm house.". It lays down nicely. There is an area that is more faded than the rest of the rug and in a very obvious place, so we are going to turn it. I just love it and am so excited about decorating the walls and furniture. . This rug gave our living room the punch of subtle color it needed. To me, the colors in real life look exactly how they are depicted in the photo. I spent several hours (like a whole bunch) shopping for a rug online. They are not easy to return, so I read ALL the reviews and looked at all the pics. 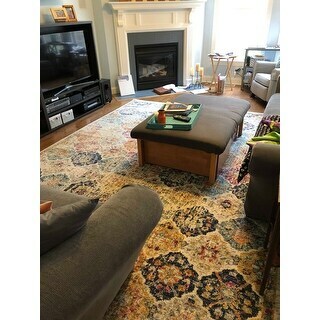 This rug is tricky because in the photos posted with reviews the colors looked very different depending on the lighting. The rug is navy, aqua, fuschia, gold and gray. The distressed look breaks up the colors so they are not overwhelming. The background is cream. I have gotten a lot of compliments so far. This rug is on the thin side. 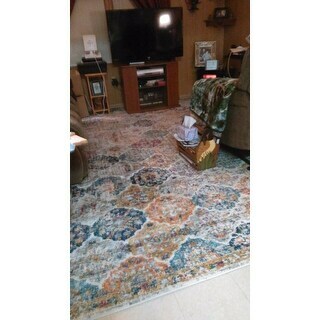 I purchased another rug from Safavieh that was much softer, with a deeper pile. While comfort is important, I think this rug is perfect for high traffic areas. It vacuums up well and I bet would hide stains, too. Definitely worth the price. This rug arrived on time, and it was just what we expected from the pictures. We have a small home, with the living room and dining room in an 'L' shape. The floors are a rust/brown/some cream color 12" tile - hard to find something with color that doesn't 'clash.' 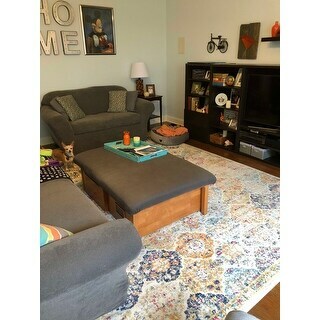 The 9' x 12' rug works very well and really livened up our living room with the light background and the variety of colors. 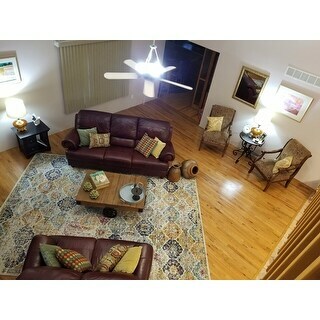 Since the rug covers a large portion of the floor, the furniture appears to be in a bigger room. (Our previous rug was a lot smaller which made the eye's focal point smaller.) We also ordered a matching rug for the dining area - still waiting for it to be delivered. The rugs are a bit thin, but for the price you can't expect too plush! We did not purchase the rug pads at the same time just in case we didn't like the rugs when they arrived and we would have to return them or sell them locally. We now feel that we want the rug pad, and will try shopping locally for that. Another big plus for us is that the rugs came to our door by FedEx; we didn't have to borrow a truck to get rugs home from a store. 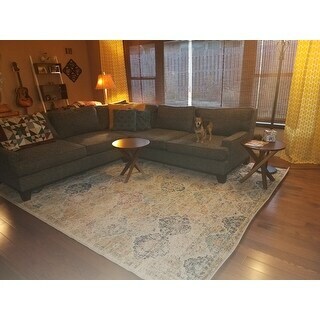 I just received my rug last night and couldn't be happier. The style is so me, it is casual but elegant. It makes me think of dressing up a pair of jeans with silver and pearls. I currently have red couches and chrome and glass tables and it blends nicely. I think it would look pretty good with any color actually. I see shades of gold, gray, pink, blue and cream. It isn't a plush rug, (many have called it thin). It is very soft, smooth, and feels good underfoot, and you certainly can't see through it. I would call it "low profile". The manufacturer didn't add an extra layer of cushioning. This allows the purchaser to choose their own. I am going to buy a rug pad, as I have two dogs that don't like to lay on tile and are used to wall to wall carpeting. I think otherwise, it would be fine as is. This Safavieh Madison Bhoemian Vintage Cream/ Multi Distressed Rug looks pretty close to what the picture depicts and is a beautiful peace to tie a room together. This rug arrived as advertised, and the packaging protected it in our Colorado winter weather. I am very happy with the colors and quality. It has added the exact right atmosphere to my home and lays beautifully on my light hardwood floors. I change accessory colors with the seasons, and this rug compliments them all - blues for winter, yellow for spring, brights for summer, oranges and golds for autumn, and then joyous Christmas explosion. Teals, greys, and pinks would also coordinate well. The intentional fading of this rug works so well in my home where I try for an elegantly rustic feel. This was my first purchase with Overstock, and I am quite satisfied. Rug arrived quickly and looks very much as pictured. I like the pattern and colors. The rug is thin and does not feel very soft. I am keeping the rug because I feel the value is there, but if you are looking for a substantial rug, you may want to consider a rug pad. I love this rug! 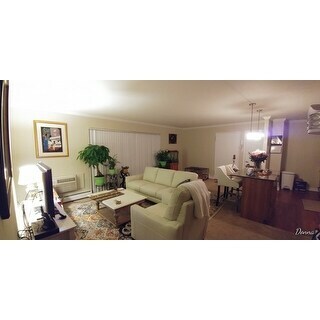 The 9'x12' is perfect under my 9'x9' sectional that is a navy tweed with gold & pale blue. It seems nicely made & did not shed at all when I vacuumed it. I bought a non slip pad for underneath but I plan to upgrade the pad to something softer. I love this rug! The colors were exactly as I expected. I just got new grey slip covers for my couches and this carpet looks great with them. I plan to get new pillows in navy, aqua and orange to pull out the rug colors. There is also yellow and pink in the rug. I was worried that those colors would stand out too much (not colors I wanted in my rug), but they don’t stand out too much. I would definitely recommend this rug. I also bought a round matching rug for my entrance hallway, and it’s great too. I ordered two of these, one for my bedroom and one for the living room.. so far I'm loving them... They feel so good under your bare feet. Heavy upon delivery. Easy to lay. Good quality for the value. Enhanced my decor perfectly. I ordered a matching 5' x 8' for the bedroom and can't wait to get it. 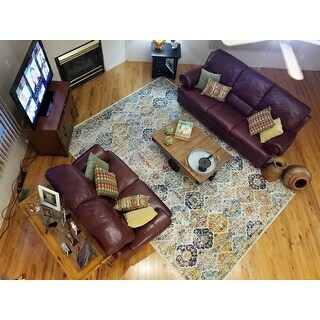 I purchased this rug for my family room which has other hints of cranberry, mustard, and navy colors. I chose this one because of the richness and diversity of the pattern. It is so beautiful but not overwhelming. We had a different Safavieh rug in there previously but the quality was not good; this one is definitely a step up. It is soft for my toddler daughter to play on and will probably hide dirt and stains well. I would purchase it again. 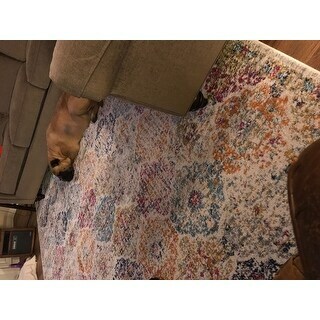 Good rug at great price. 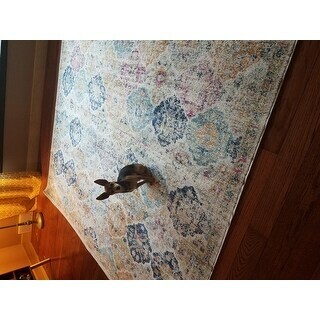 For a rug this size, at this price, I couldn’t be happier. It’s a little thinner than I typically like but doesn’t feel cheap. I’m very happy with this purchase. Beautiful rug and works so well with almost anything. I have 3 dogs and the color and design is forgiving of paw prints. Must have a good pad underneath as it is a bit on the thin side. I would buy again but I'm glad I didn't pay full price. I really enjoy this pattern, really goes so well with my house style and colors. Easy to vacuum and spot remove. I’ve purchased several of the same rug pattern, but in different shapes and sizes. Gorgeous rugs. I am very happy with them. Taped the corners down for a few days and they now lay beautifully. I did use a rug pad for the runner to prevent slipping. Very soft, packaged nicely, the distressed look is natural and unobtrusive. I have the 9x12 and love the look of this as an "almost wall to wall" carpet in my bedroom. It works well in my brightly colored bedroom and would also look great in a kids room. Definitely planning to purchase more from this line of rugs. Absooooooolutely LOVE this rug! It matches our paint scheme perfectly. 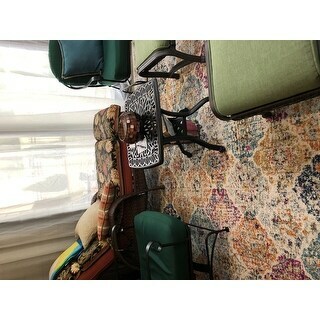 The colors are beautiful and the distressed look is apparent throughout the rug. I recommend this ! I absolutely love this area rug! The quality is exceptional and it is not a thin cheap rug! I ordered 3 more in different sizes! Very beautiful!! i love this rug. the colors are gorgeous. its very thin so you may want to purchase a pad. i'm using it in a formal living room that doesn't get much use so i can't rate how its holding up. it gets minimal usage, but it looks very pretty. i highly recommend. Great looking rug with a low pile. We needed a rug that our grandpa wouldn't trip over as his health was failing. This fit the bill perfectly. Even with the low pile, the rug is very soft and looks great. "Is this rug pretty fluffy, or more on the thin side?" The pile height is .37 inches. "How does this rug do with vacuuming? I have a Dyson Animal canister and have found some rugs are more difficult to vacuum due to the suction of the vacuum." I have 2 dogs and a Dyson. I vacuum regularly and the rug looks great. It is easy to vacuum this rug and because of the nap and design, you don’t see the pattern of the vacuum afterward, but the nap comes up and it looks great. "Can anyone tell me what undertone the "cream" background has?" This rug has a cream background with accent shades of pink, blue, orange, grey, and gold. Please note colors may vary due to dye lot variance in production. it is a true ivory background .... I have 3 different sizes of this rug in my house and it has ton of colors in it which makes it easy to match most anything. "Does the rug have differences in faded colors for each one or are they all the same?" The faded colors are intended to be the same. Please note that colors may vary slightly due to dye lot variance in production. "Can this rug stand up to pets’ claws?" This is too case specific. However, high traffic across this rug may decrease the lifespan of this rug. It is recommended that you have area rugs professionally cleaned every 1-2 years to remove deep set dirt in high traffic areas. I have had rug down for a yr with 2 dogs on it daily, so far the scratching has not effected the rug at all!! I did place a felt rubber backed pad underneath. I have been pleasantly surprised that it has remained new looking regardless of the daily wear and tear!! I have a 85 lb dog and 2 cats and my rug is still beautiful after 6 months. "This same rug in a 10x14 says that it is "latex free." However, the 9x12 says that it "contains latex." Which is correct?" Instead of a backing, these rugs have a thin coat of latex applied to the back. Therefore, the rug is not exactly latex free. "I would like to know if the red in the rug is more true red or leans toward a pink hue before I purchase it?" The color that looks like red is definately more toward magenta. However, the colors aren't bright and the weave makes it look very muted. I'm not a fan of magenta in my decorating scheme, but I really like this rug. I have it in a living room with dark blue chairs and light yellow sofas and it looks nice, matches everything. This rug is more toward a pink/magenta I have two of these rugs and I'm beyond happy with the quality for the cost. I'd most certainly purchase these again.